Planter's punch is a classic rum drink that first appeared in print in a 1908 edition of The New York Times. Like many other drinks, it's origin is disputed: One claim refers to the Planter's Hotel in St. Louis and another tells of a Jamaican planter's wife who concocted it to cool down the workers. This is also a drink that has many recipe variations. It seems like everyone has their own way of making it. While you can follow this or any other recipe, the key to this punch is to give it your personal spin and there are many substitutions available for each of the ingredients. Pour the ingredients into a mixing glass filled with ice cubes. Shake well. Top with club soda if you like and garnish with seasonal fruits. There are no rules when it comes to garnishing the planter's punch. Choose whatever fruits look good at the market right now and pile them on! From berries to cherries and citrus to tropical fruit, this cocktail is designed to have a variety of fruits and as many as your glass will hold. While this recipe is for a single serving, the measurements can easily be increased to serve at a party. Keep the ingredients in proportion, multiplying each for the number of servings needed. Mix it up in a pitcher and store in the refrigerator until it's time to serve. Add club soda and ice to the pitcher at the last minute or in the individual serving glasses. If you want to skip the rum, there is a nonalcoholic planter's punch that is quite tasty as well. How Strong Is a Planter's Punch? If you pour an 80-proof rum in this recipe, the alcohol content will be in the 14 percent ABV (28 proof) range. Adding club soda makes it even milder, just around 10 percent ABV (20 proof). Either way, it's a very light cocktail. The planter's punch takes the name "punch" in the traditional sense. Rather than the party-sized serving associated with the word today, the definition of a classic punch is that of a fruity mix spiked with liquor and garnished with lots of fruit. This means that every single ingredient in this punch can be replaced with whatever you like. That's great news if you're reading through the recipe and find that you're out of one particular ingredient. No grenadine in the fridge? No problem! Ran out of dark rum? You can still mix up a planter's punch. Each substitution will create a slightly different drink, but that's half the fun. There is no chance to be bored with this cocktail and you can create very own planter's punch recipe. While there are common substitutions, there's no need to stop with these. As long as you have rum and fruit juice, you pretty much have a planter's punch. Any rum will do just fine in a planter's punch. Though the dark rum adds a richness in the background, a light rum will work just fine. Spiced and flavored rums can also give the drink a new twist. If you don't have grenadine, pour 1/2 ounce pomegranate juice and 1/4 ounce simple syrup instead. Lime juice works as well, though it changes the flavor. You can also use any other fruit syrup, such as strawberry, raspberry, or the tart sour mix. The fruit juice is where you can really play with this recipe. At some bars, you will find a "bar punch mix" used instead of individual juices. Pineapple juice is a favorite, though orange and passion fruit juices are common as well. This is also the perfect drink to pour one of those bottled fruit juice blends that fill the juice aisle of grocery stores. When choosing one, make sure it includes at least one tropical fruit. Though it is optional, adding a splash of club soda creates a livelier planter's punch. If you like, substitute that with ginger ale or a citrus soda. Either will add another layer of flavor as well as a hint of sweetness. Among the many planter's punch recipes out there, you will find additional ingredients. Consider adding 1/2 ounce to 3/4 ounce orange curaçao or another orange liqueur or finish it off with a few dashes of aromatic or orange bitters. 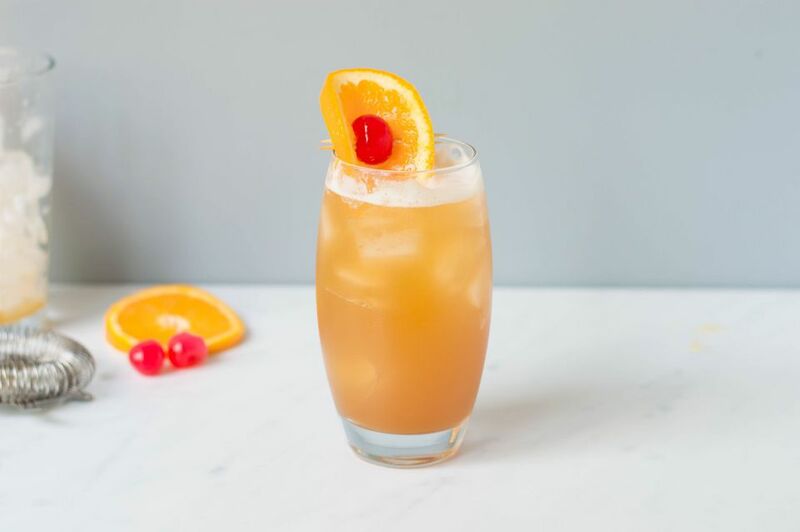 You might even add a twist with favorite tiki cocktail ingredients like 1/2 ounce of orgeat syrup (to replace the grenadine) or a splash of pimento dram.